your profile form. Edit and modify the fields based on your needs. When you have done with editing, click Save Changes. Now your profile form is totally ready to use. also disable or enable AJAX submit there. Write user-meta shortcode to page or post for your profile form. To create page go to page >> add new. *Change “Form_Name” with your created form name. Write user-meta shortcode to page or post. To create page go to page >> add new. Use this shortcode to show profile when uses logged in otherwise show registration form. Use this shortcode to show public user profile. To enable public profile, user_id parameter need to provided as GET request. So your profile url should looks like http://example.com/profile/?user_id=123 This feature is useful when you integrate this plugin with third party plugin. User profile can be shown as widget. Go to Appearance >> Widgets for available widgets. There will be new widget named User Meta Form. This widget can be use for showing user profile as widget. 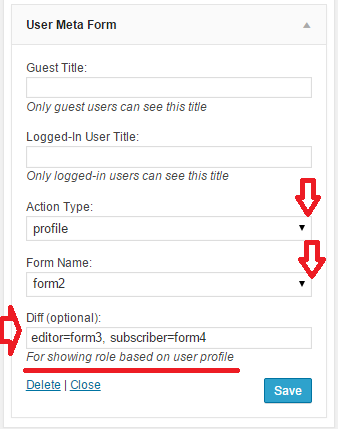 In widget configuration set your Action Type as profile and Form Name as your created profile form name. Custom user profile can be use as template tag anywhere in your site by using PHP. For widget fill up Role_Name=form_Name format to Diff(optional) input. For template tag, create an array with role as array key and form name as array value and pass the array as third argument.